Never enough hours in the day! I often find myself thinking this, wishing for a magic wand or time-management fairy godmother to grant me some extra hours to get just a little bit more done. Finish off a couple more emails, take the kids to the park, go through just one more extra report, cook a big pot of Bolognese in advance so my family will have something to eat when I’m at meetings. Just a tiny spot of time more. Oh why didn’t I clean up my inbox instead of sleeping in for two extra hours last Sunday (well, because it was Sunday…for starters)? Sigh…the constant tug of war among the myriad of “things” that just need to get done, this minute, this second. Slow down life, there are roses meant to be sniffed and wines meant to be savored. So, I do the best I can, managing the to-do list (still hand-written in a notebook…yup, I love ticking things off that way! ), balancing home and work and the little ones and husband-date-time and friends and me-time. Things sometimes fall to the wayside, or dinner is late (or take-out), or it’s midnight and I am trying to squeeze in as much as I can into my final moments of lucidity before I fall upon my pillow…and even in my weariness my head spins with a dozen dashing thoughts until they finally relinquish me to sleep. But even then, even now, even in the most frenzied of times, it is all worth it. My baby’s saliva-smelly onesies, my daughter’s raggedy toenails, how they run to me when I open the door, my husband’s high-fives when we have a particularly stellar meal at home, our cozy bed, clacking away at this blog, chronicling our meals, and the satisfaction of a (day) job well done…all worth it. I wouldn’t give up a single one of these things, even if it means being a little frayed around the edges sometimes. But. But. There are important events for which time needs to be carved out. Like making brownies. Particularly making brownies with my headstrong little helper who won’t always be so little, or have so much time to help her mama. 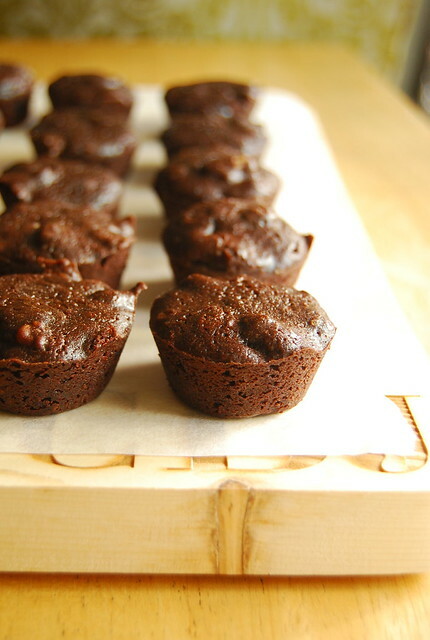 – Butter and flour 3 mini muffin pans (I used 2 and a half, making about 30 brownie bites). – Place the 5 ounces semi-sweet chocolate, unsweetened chocolate, and butter in a heatproof bowl set over (but not touching) a pan of simmering water (or use a double boiler if you are lucky enough to have one). Melt the chocolate and butter, stirring until smooth. Resist the urge to dive right in. Set this aside to cool slightly, about 5 minutes. – In the bowl of an electric mixer fitted with a paddle attachment, beat the chocolate mixture and sugar at medium speed until well combined, about 3 minutes, scraping down the sides of the bowl as necessary. To this add the eggs and mix until completely combined. Beat in the vanilla, and then add the flour and salt and mix until just incorporated, taking care not to overbeat. Stir in, by hand, the other 5 ounces of semi-sweet chocolate and the walnuts. – Scoop batter into the prepared mini muffin pans just until 3/4 full. Bake in a pre-heated 375F oven for about 10-11 minutes, rotating the pans halfway through. Remove the pan to a wire rack for about 5 minutes, then pop the brownie bites out to cool completely on the wire rack. This was actually meant to be brownie cookies, but when I looked at the finished batter it seemed much too wet. There was no way, barring the fairy godmother, that I was going to be able to shape it into balls as the recipe dictated. I felt I had followed the recipe exactly but it was just not going to happen. I took one look at my excited assistant and knew that I had to think of a solution, and fast. A light bulb went off in my head and, taking inspiration from one of our neighbors’ daughters, I grabbed my mini-muffin tins and cooked the batter in that. Thankfully that proved to be a success! They turned out to be these intensely chocolate brownie “bites” with pockets of melted chocolate throughout. Little C proudly brought some to share with her friends at school…and I must say, we ate our fair share as well. I have another full day of meetings tomorrow, capped off with a dinner with my valiant team leaders at work. We will then be off bright and early the next day for a company team building, for which we have secured the services of a guy I am excited to be working with. I will be back on Sunday, hopefully enriched and re-focused, although I am sure in need of putting my feet up. I leave you with chocolate, and the battle-cry that, yes, we can do it! Hang in there. Keep the faith. Hold on. The ride is worth it. « It’s Friday…and some links for the weekend! I gotta make some of these with my little miss this weekend! Looks really good! Hi, would love to make this but for some reason I don't see the amount of flour???? Thanks! Oooops, my bad. Just saw it – 1 cup! So sorry . . . . ! How she has grown, Joey – time has really slid by… 🙂 Lovely to see her helping out and learning! Hi Maria! Hope you enjoy it! Hi Katrina! Yes!! Well, let me tell you, things have definitely changed…now she is quite the chocolate monster!!! Midge! You are moving away! We should have that coffee before you go 🙂 Wow BGC…you will be near a whole new slew of restaurants!